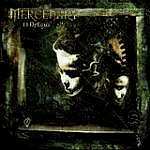 Review: "Mercenary: 11 Dreams" - Sea of Tranquility - The Web Destination for Progressive Music! Denmark's Mercenary are following bands like In Flames and Soilwork in terms of adding more symphonic and melodic elements to their brand of extreme metal with their latest release 11 Dreams. A greater emphasis is placed on catchy vocal hooks, where the clean vocal passages from Mikkel Sandager trade off with the more aggressive death/black metal stylings from bass player Hans 'Kral' Andersen. For example, "World Hate Center" is a brutal power metal stomp featuring heavy guitars and Andersen's wicked shrieking, but the powerful title track is one of the best symphonic metal songs I have heard in a while, with Sandager's majestic vocals soaring above the huge backdrop of keyboards and prog-metal arrangements. A similar approach is taken on "reDestructDead", a speedy & blistering cut that showcases once again Sandager's histrionic vocals as well as the shredding guitar work of Martin Buus. Songs like the raging "Firesoul" and the lengthy "Supremacy v2.0" rampage along at a fierce and thunderous pace, which is probably where many of the Nevermore and Devin Townsend comparison's seem to be coming from these days. To be honest though, Mercenary has a bit more tricks up their sleeve than those two acts, as you can surely hear on a track like the gorgeous "Sharpen the Edges", with its majestic keyboard work from Morten Sandager and passionate vocals from his brother Mikkel. Then you have something like "Music Non Stop", a tune that sticks in your head and never leaves, with catchy melodies, strong vocals, chunky guitar work, and bubbling keyboards. Fear not extreme metal fans-there are still plenty of aggressive & deadly pieces here that you can sink your teeth into. "Falling" is a crushing song that sees the wild death metal screams from Andersen doing battle with Sandager's high pitched melodic wailings amidst a furious metal riff-o-rama, while "Loneliness" is a truly compelling symphonic slice of speedy death/power metal. Century Media has an absolute winner here folks. All reports are that the bands appearance at last years ProgPower USA in Atlanta, Georgia was a total success, and with the release of 11 Dreams Mercenary seems set to carry that momentum even further. Every so often a Metal band comes along with a CD that could possibly change the direction and level of quality in the genre. With the release of 11 Dreams on Century Media Records, Mercenary has proved themselves to be one such band. As you listen to this piece you will find yourself surrounded by a wide variety of textures and feels. Is it Black ? Is it Progressive? Is it Traditional? To be honest there is a fine mix of all these aspects of the Metal genre which makes it very difficult to define under one label or criteria. After a brooding keyboard intro the game is on with "World Hate Center" which thunders in guitar and drumming and even in one's living room or desk at the office you will find the fist raised in Metal support. Taking a page from the Soilwork book the guys in Mercenary use two vocal styles to some positive effect. Most of the piece is growled through by bassist Kral yet the clean and powerful voice of Mikkel Sandager take you through the darkness. At times Mikkel reminded me of Midnight from Crimson Glory with his pure and passionate vocal lines. There are a lot of strong musical expressions on the CD and I admit that my very favorite tracks comprised the earliest section of the record. "11 Dreams" and "Firesoul" are excellent and in each of them the band performs admirably. These guys are a talented bunch and it's clear from this album. After this offering I feel that we are only seeing the start of what the group is capable of. It's the kind of band that fans of Soilwork might really enjoy because it is very in your face like they are yet they also venture off into different musical feels that one does not always find in a Heavy Metal band. The use of keyboards is impressive and the appearance of them on top of the big harmonies the band introduces in choruses brings a lot of these songs to life very well. Keyboards are delivered with finesse by Mikkels Brother Morten. There are a couple of epic numbers running at 7 and 8 minutes each and the band does not get boring in them by any stretch of the imagination. One sometimes dreads the extended artistic expression for it can lose something by being too long. Time seems to fly by in the case of Mercenary. The bonus tracks are different renditions of the song "11 Dreams". I felt that the radio mix is pointless since radio people get their specific copy of the release but the 3-D mix is unique. I suggest you wear headphones for this one as the effect with the recording aspects is very interesting. This truly has to be one of the best Metal releases in 2005, and given it came to us in February this was not an easy judgment call to make. It has my highest of recommendations and I think many will be on the same page with me very early in their listen. Mercenary is a Danish band consisting of Mikkel Sandager (Vocals), Kral (Vocals, Bass), Jakob Molbjerg (Guitars), Martin Buus (Lead Guitars), Mike Park (Drums), and Morten Sandager (Keyboards & Backup Vocals). They recently made their recording debut with Century Media with 11 Dreams. Opening the CD is a synthesizer intro, leading the listener to believe that we are going to hear a prog metal CD, start to end. Much to my surprise, Mercenary threw quite a few different hooks in there, as they are indeed a prog metal band, but at times will switch to a much more thrashy and dark metal sound. They demonstrate this almost immediately with "World Hate Center", which is an all out thrash fest. At various points in the album, they switch between a very aggressive style of singing, to a more normal prog sounding vocal style. This is evident in the title track, "11 Dreams". Also evident are some excellent vocal harmonies throughout the CD. Regardless of the vocal style they choose to use, they are indeed a very talented band. Any band that can go from sounding like Pantera one minute to sounding like Dream Theater or Stratovarius the next certainly is. We get some great guitar shredding from guitarist Martin Buus in songs like "11 Dreams", "Firesoul", and "Falling". Drummer Mike Park keeps a good consistent rhythm throughout, and we also get to hear some good keyboard work from Morten Sandager in "Firesoul", ala Michael Pinnella of Symphony X. We then get to slow down on "Sharpen The Edges" with some acoustic guitar, with a vocal harmony similar to something you might hear from Stratovarius. "Times Without Changes" also offers a slower pace. Highlights from this album include the title track, "reDestruct Dead", "Sharpen The Edges", "Falling", and "Loneliness..". For those of you that like to hear a variation of metal genres from one band, Mercenary is definitely one group to consider. I look forward to their next release.